← Hill Climbing in the Montrose Flattop Free Riding Area – Wild Stuff! That's Flattop in the upper left hand corner. Everything between where I took this picture and the base of Flattop is free riding area. Note the arroyo. This picture was taken from approximately Point A on the GPS map. It’s snowing today. Too bad. Yesterday it sure wasn’t. In fact, Montrose (Colorado) sported temps of 70 degrees! And the adobe formations north of Montrose were dry! What’s that mean? Go riding! So I trailered my Yamaha XT-250 up to the parking area for the Flattop Free Riding Area. Access this from 6530 Road, which is easy to find if you’re on the Hwy 50 bypass. Here's how you get from the north side of the arroyo to the south. 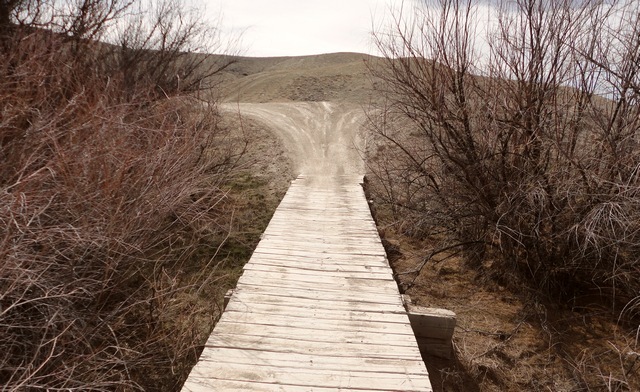 The bridge is wide enough for foot traffic, motorcycles, and small ATVs driven very carefully. I’d never really explored the free riding area. It’s huge! After an exploratory trip atop Flattop to look the place over, I decided that it was time to find out what’s out there. The answer is: lots! There’s riding for the beginner just south of the parking area (tame little stuff) to the somewhat more daunting (just to the east of the parking lot) to expert level (see a separate post with a video of some crazy hill climbers). Being a moderate rider, I had to avoid some of the steeper hills. I did try my hand at climbing some and found that the issue was not the size of my engine, only 250cc, but rather my rear wheel started spinning and spitting dirt. I also went down some pretty steep trails too. The whole area is mostly soft dirt, but I still wouldn’t want to part company with the bike halfway down one of those hills! Here's my route through a part of the free riding area. There are MANY more trails available. I want to make mention of how handy the GPS came in. When you’re between the hills, one trail and one hill looks pretty much like any other. I was able to backtrack using the GPS – something I recommend! And below is the official map at the parking area. Note that Flattop itself is technically not in the free riding area. The parking area is improved with graveled access, quite a number of places to park trailers, an unloading area, and a restroom. They also post a note that says that while this is a free riding area, truly stupid stuff like trying to mess with the trails, etc., can get you into trouble. Here's the official map at the parking area. Note that Flattop itself is technically not in the free riding area. I only explored a smidgen of the area. 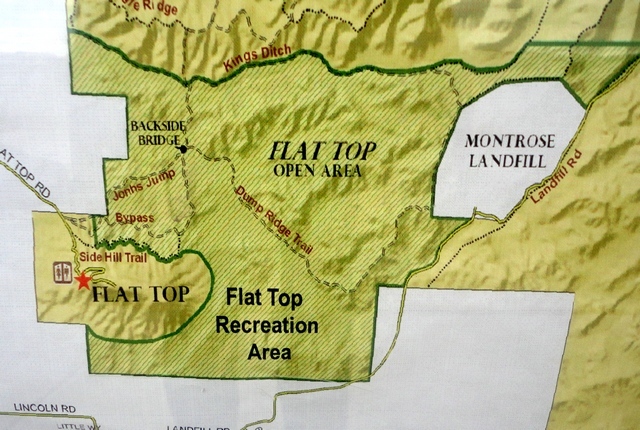 This entry was posted in Montrose County, Motorcycling and tagged Flattop free riding area. Bookmark the permalink.